For new readers, this collection of “missing links” rounds up fascinating stuff I find around the internet, and appears every Saturday. It’s separated into Top Picks (the best stuff), Science/News/Writing (science writing), Heh/Wow/Huh (silliness, satire, photos, videos), and Journalism/Internet/Society (a miscellany of my other interests). If links are broken, let me know in the comments. “Restless genes” by David Dobbs, about the genetics and other factors behind the human urge to explore, is one of the best science stories of the year, let alone the week. It’s beautifully written without sacrificing nuance. I know David personally, and I know how much he agonises about capturing the complexity of the science that he covers. And when someone does that, and puts in the work, you get results like this. Giant crabs are marching on Antarctica. Douglas Fox narrates their invasion. A very cool experiment: scientists transform fish fins into sort-of-but-not-really hands. By Carl Zimmer. Alexis Madrigal, Becca Rosen, and Megan Garber tell you about the year in technology. Essential. You may have heard about mirror neurons. That’s because they’re the most ridiculously hyped concept in neuroscience. Here’s the reality, from Christian Jarrett. Jeff Ingram repeatedly gets total amnesia, but his wife is his memory. Amazing story. Impressive: conservationists have eradicated all rats from Rabada Island in the Galapagos. By Henry Nicholls. Here’s everything you need to know about the new coronavirus from the Middle East, by Maryn McKenna, Helen Branswell, and Declan Butler (with a great interactive) . Scientist gets stung by box jellyfish, recovers after days in pain, then finds a treatment. By Christie Wilcox. This piece by Brian Switek, on a hypothesis that puts life on land 65myrs early, is a great example of critical reporting. Also note: it’s a Nature news story that takes down a Nature paper. Editorial independence FTW! When is grieving a sickness? Controversy over psychiatry’s new rules for bereavement and depression, ably covered by Brandon Keim. Carl Zimmer: an example to us all. Check out his Reddit AMA on parasites and more. Which comes first as we age: ill health or declining bacterial communities in our guts? Virginia Hughes investigates. Remarkable! A 120-Year-Old Mechanical Device that Perfectly Mimics the Song of a Bird. Parasites in your skin is the new Jesus on toast – a case of photoshopping parasites into existence? By Neuroskeptic. “It’s like watching a natural Manhattan breaking apart in front of your eyes.” – birth of an enormous iceberg! Western chimps are very different to eastern ones… but just how different? From one slow loris species to four! (2 are reclassified subspecies; 1 is new). Also doesn’t the loris in the photo look delighted about the news? “The patient’s arms were peculiar and stiff because the elbows were actually knees.” Awesome mutation story from Ricki Lewis. Phil Plait has a good piece on the death of Sir Patrick Moore, including the good and bad. Traces of the world’s oldest cheese: 7,500 years old and it would have tasted like mozzarella! Great piece by Judy Stone on a psychiatric clinical trial, a participant’s suicide – and questions. Day #9483: Squid land shock-troops still underperforming. Consider exoskeleton. We eradicated the virus, but people think lab stocks should be destroyed. No, not smallpox. The other one! Crayons named after the chemicals that burn with a similarly coloured flame! Yale scientists name Obamadon, a slender-jawed lizard after the President. (It’s apparently so boring that the artist had to put it in a corner (it’s the blue one) and add dinosaurs). 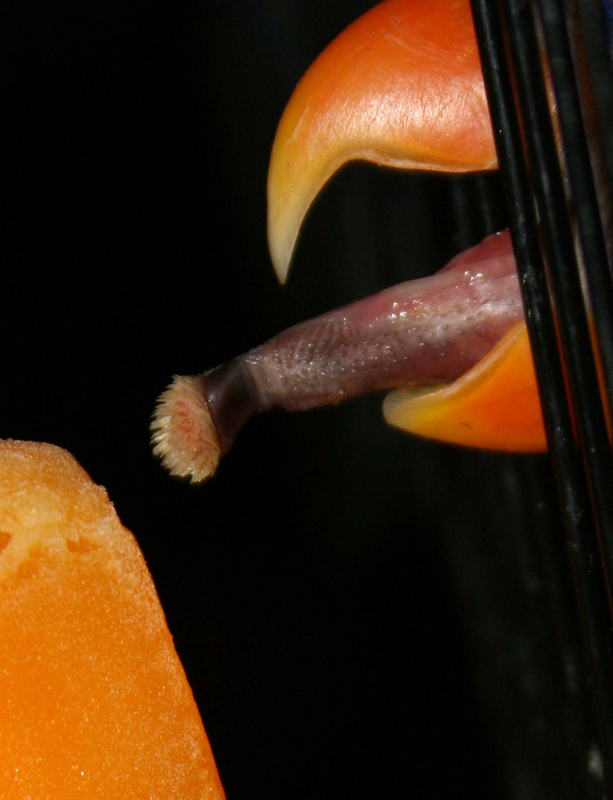 Tongue of a Lorikeet. Wow. On why we get most of our knowledge by relying on experts: John Kubie on “epistemic closure” in his new blog. Tyger tyger burning white. A compelling case against keeping white tigers in zoos. What is and isn’t a scientific debate by Dave Hone. I love this picture of a Chinese zoo escape drill so much. “Q: what did batman say to robin before they got in the car? A: get in the car.” Bad kids’ jokes. Bane’s “outtakes” from The Dark Knight Rises. Man likes his fibre. The winner of the Bulwer-Lytton Contest, where people write the worst opening sentence of a novel, has been announced. And it’s about FACEMITES! The Oatmeal responds to a Buzzfeed hit piece. Wow.